The dawn of a new entry in the renowned Golden Sun™ video game series has nearly arrived in North America. Nintendo has announced that Golden Sun: Dark Dawn for the top-selling Nintendo DS™ family of portable game systems will launch on Nov. 29. Offering a planet-sized world of adventure to explore and conquer, Golden Sun: Dark Dawn puts the raw power of the elements in players' hands. Each of the game's playable characters is capable of carrying Djinn, spirits that imbue their owner with unique and powerful abilities. Players can collect more than 70 unique Djinn, granting them the ability to summon mighty deities who unleash devastating attacks that fill both Nintendo DS screens. Djinn powers can also be used to navigate puzzling dungeons and overworld environments that will have players flinging fireballs to burn away obstacles, freezing water to raise platforms, or summoning whirlwinds to create bridges out of floating objects. 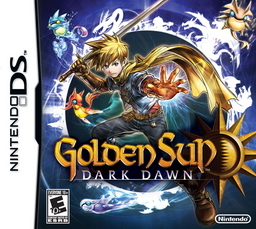 Taking place 30 years after the events of Golden Sun and Golden Sun: The Lost Age for the Game Boy™ Advance system, Golden Sun: Dark Dawn introduces a new generation of heroes that are struggling to survive in a radically changed world. What begins as a simple journey to rescue a lost friend turns into a dramatic quest to save the land from catastrophe as players are drawn into a world full of magical energy.